Born in Haag, Austria in April, 1900, Bayer was accepted into Germany’s Bauhaus in1921, where he embraced the school’s philosophy of functional design. Immediately apparent was his cross categorical facility with all varieties of design, including painting, photography, typography, and graphic design. 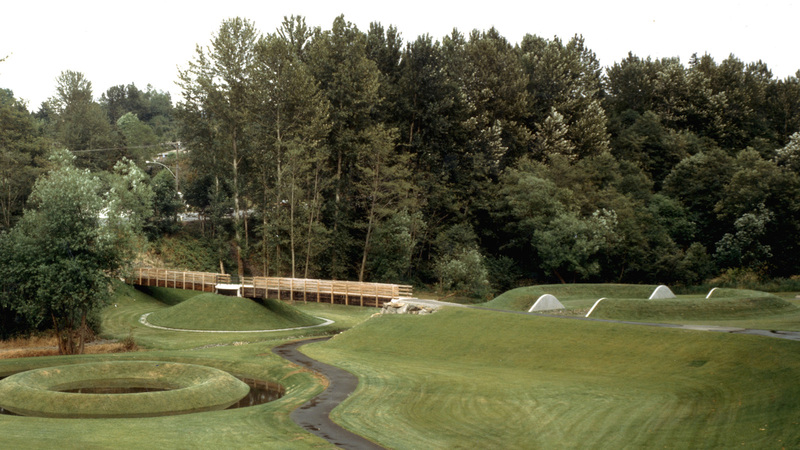 Bayer’s final environmental work, Mill Creek Canyon Earthworks Park in Kent, Washington, combined the sculptural vocabulary of his Aspen projects with ecological functionalism. The two-and-a-half-acre site was designed to retain stormwater from the eponymous watercourse as it flowed down through a tight canyon. A series of berms, mounds, and excavated rings provided sculptural interest for viewers as they meandered through the composition. Mill Creek Canyon Earthworks Park is Bayer’s most acclaimed work due largely to its successful resolution of two perceived competing interests: art and ecology. Herbert Bayer was born in the hamlet of Haag, Austria, on April 5, 1900. His father, a government revenue officer, and mother encouraged young Herbert’s interest in nature and art, allowing him to roam into the hills and mountains near his childhood home in Linz with his sketchbook. Although Bayer had aspired to attend art school in Vienna, his father’s early, unexpected death dashed those plans. Instead, Bayer took a position as an apprentice in the local architecture and decorative arts studio of Georg Schmidthammer, where young Bayer gained valuable skills in graphic design, drafting, and production. Looking for a change, Bayer migrated in 1920 to Darmstadt, Germany, where he worked for the architect Emanual Margold. Between his duties creating package designs, Bayer heard stories of an emerging national design school in Weimar. Bayer was accepted into the Bauhaus in October 1921. The education Bayer received at the Bauhaus shaped the rest of his life. Under the influences of Walter Gropius, Laszlo Moholy-Nagy, and Wassily Kandinsky, Bayer gave himself over to the school’s philosophy of functional design. Though Bayer maintained interests in painting and photography, he was encouraged by Gropius to focus in the areas in which he excelled: typography and graphic design. In 1923, Bayer took a break from his studies to travel in Italy. As in his boyhood, Bayer walked extensively, stopping to sketch or paint when the mood suited him. Complementing his academic focus on the functional arts, Italy nourished Bayer’s respect and appreciation for nature and art. Upon returning to the Bauhaus in late 1924, Bayer continued to experiment with and explore a variety of techniques. After passing his examinations in February 1925, he was invited to the school’s new home in Dessau to teach typography and graphic design. Bayer’s tenure as a master at the Bauhaus was as important to him as his education there had been. His Bauhaus position allowed him to accomplish two important goals. First, he was able to continue his experimentation with various media, resisting categorization into a single artform. Secondly, he was able to initiate his own professional design practice. Bayer was also instrumental in making the Bauhaus synonymous with an emerging, Modern design aesthetic. Beginning in 1925, the Bauhaus adopted a fresh graphic design identity to use in all of its correspondence and publications. The Bauhaus graphics incorporated a newly created sans-serif lower-case typeface called Universal that was designed by Herbert Bayer. In 1928, Bayer along with Gropius, Moholy-Nagy and architect Marcel Breuer left the Bauhaus for Berlin. Again, Bayer established his own design firm. Berlin gave Bayer opportunities to increase his professional scope and acclaim. Working with such clients as Vogue magazine and the international advertising agency Dorland, Bayer incorporated his photography, which revealed the influence of surrealism and Dadaism on his work, into his graphic design commissions. Bayer was also asked—along with Gropius, Moholy-Nagy and Breuer—to design an exhibition for the Societe des Artistes Decorateurs in Paris. Other design commissions to create exhibitions followed, including work for the Building Workers Union, Berthold Type Foundry, German Cork Industry and various industrial and traveling exhibitions. This experience and his reputation as a Modern exhibition designer would prove important for Bayer’s successful move to America. Fleeing the repression of Nazi Germany, Bayer moved to New York in 1938. He established an office below the Museum of Modern Art (MoMA), then housed in Rockefeller Center. Spurring Bayer’s emigration was his nomination by a group of his former Bauhaus colleagues to assemble the first major Bauhaus exhibition in the United States, to be held at MoMA. Upon its opening, Bauhaus 1919–1928 was hailed as a pioneering moment in American exhibition design. The acclaim of this success quickly led to two more exhibition design commissions: Road to Victory, directed by Edward Steichen at MoMA, and Airways to Peace, an exhibition on flying. Parallel to this exhibition design work, graphic design remained the mainstay of Bayer’s practice, and while in New York he worked for a variety of high profile clients. Life and Fortune magazines both used his services, as did book publishers and corporations, including General Electric and the Container Corporation of America. During the holidays of 1945, Walter Paepcke, the head of the Container Corporation, invited Bayer as his guest to the old mining town of Aspen, Colorado. There Paepck e offered Bayer a position as the design consultant to both his company and the dilapidated town as it was being transformed into a world-class ski resort. The allure of the mountains combined with the scope of the project trumped Bayer’s reservations about abandoning his successful practice in New York. Bayer moved to Aspen, where he remained until 1974. Among several smaller projects in Aspen, Bayer’s largest responsibility was the design of the Aspen Institute for Humanistic Studies. This project was Bayer’s first opportunity to work within a site-specific context to create a physical intervention that worked with its environment. Bayer’s scheme harmonized the program elements of a conference center, hotel rooms, restaurants, and a health and exercise center with the surrounding natural topography. 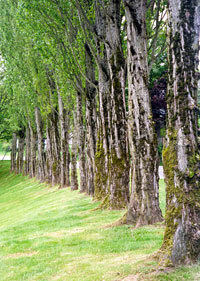 Bayer relished this environmental design challenge, and began to create several landscape pieces. In 1955, the first of Bayer’s sculptural environments was built in Aspen. 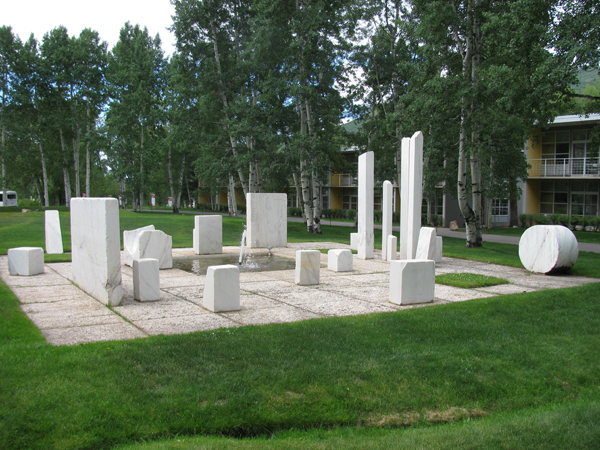 Marble Garden consisted of a series of up-ended marble slabs set onto a plinth to provide refuge from the open lawns of the Aspen Institute. Adjacent to this piece was Earth Mound (also called Grass Mound), dubbed by Jan van der Marck in his book, Herbert Bayer: from Type to Landscape, as“the first instance on record of landscape as sculpture.” A forty-foot-diameter berm, Earth Mound formed a circular mound within the grassy plane, a place to sit and read within Aspen’s expansive meadows. Although Bayer himself never acknowledged the relationship between his work and earthworks; he did not like the appellation nor did he like being labeled. His outdoor work in Aspen formed the precedent for the earthworks art movement that was to emerge a full decade later. 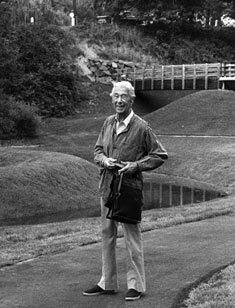 Though he continued his design work developing marketing materials for Aspen and the Container Corporation, Bayer did not work with earth again until 1973, when he designed Aspen’s Anderson Park, the largest of his environmental projects. Borrowing elements from both Marble Garden and Earth Mound, Bayer created in Anderson Park a series of paths that meandered over and around geometric berms, divots, and rings. 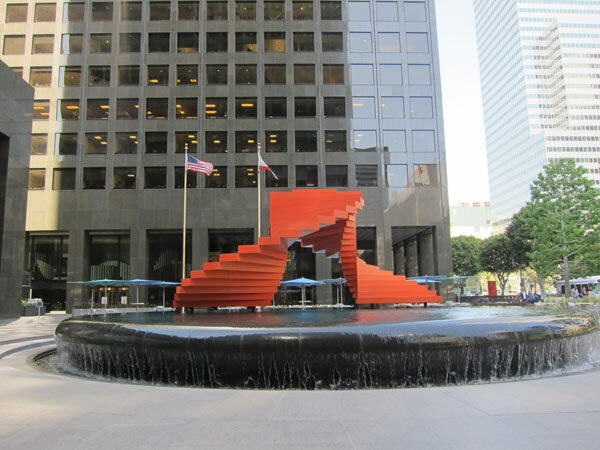 Bayer’s work in the landscape expanded into outdoor sculpture as well, including Aspen’s Kaleidoscreen (1955); Articulated Wall (1968), a commission for the Mexico City Olympics; and Double Ascension, built for Atlantic Richfield (ARCO, 1972). Bayer also remained active in graphic design, book layout, mural painting, publishing, exhibition design, and industrial beautification. His painting also flourished, with imagery influenced by surrealism, Modernism, and color theory as well as his personal experiences. Though these years were pleasant and productive for Bayer, the harsh extremes of Aspen’s climate were taking a toll on his health. 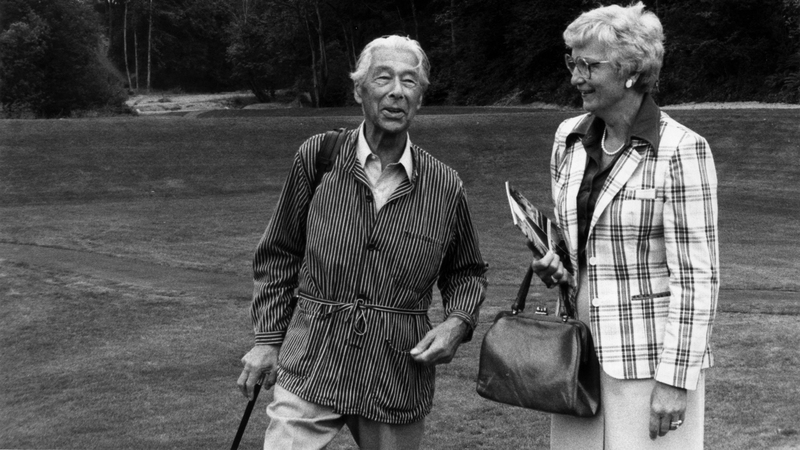 In 1975, Bayer moved with his wife, Joella, to Montecito, California. Removed from the place that he had shaped for 30 years, Bayer continued to work prolifically on a variety of projects. His work for ARCO occupied much of his time, particularly the Breakers project, which involved renovating and redesigning the interior and exterior spaces of an aging mansion overlooking the Pacific Ocean, transforming it into a plush executive headquarters for training. And as always, Bayer continued to paint. In California, his visual language became more introspective and regressive. Lifelong themes of mountains and geology, nature, and color came to the fore in his Anthology series of paintings. Bayer’s final environmental work, Mill Creek Canyon Earthworks Park in Kent, Washington, combined the sculptural vocabulary of his Aspen projects with ecological functionalism. The two-and-a-half-acre site was designed to retain stormwater from the eponymous watercourse as it flowed down through a tight canyon. A series of berms, mounds, and excavated rings provided sculptural interest for viewers as they meandered through the composition. 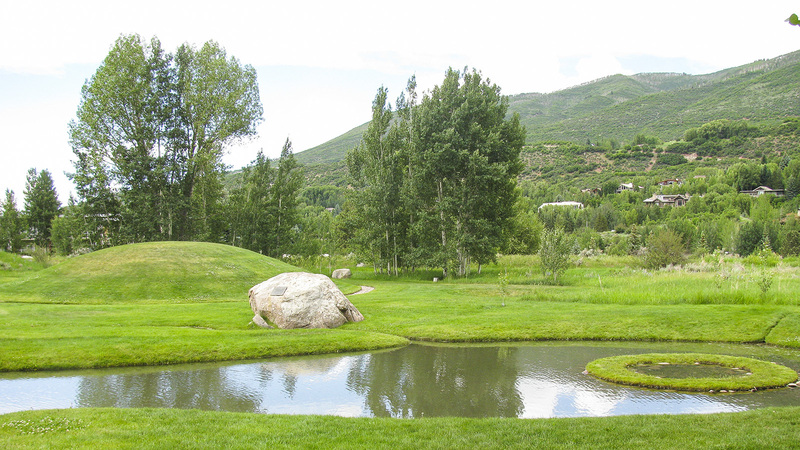 Mill Creek Canyon Earthworks Parkis Bayer’s most acclaimed work due largely to its successful resolution of two perceived competing interests: art and ecology. However, the Bauhaus master likely saw both of these components as merely integrated parts of the larger field of design practiced in its myriad of expressions—an approach he had employed for his entire, remarkable professional career. Herbert Bayer passed away in Montecito, California, in 1985 at the age of 85.